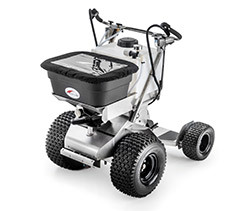 The Pathfinder from Ground Logic touts an all stainless steel construction, simple steering mechanism, a reliable Spyker hopper and a rugged Honda engine. The tight turning radius and low center of gravity allow it to tackle tough terrain, and the narrow 36-in. width lets you go where the grass needs you. The Pathfinder is one member of the Ground Logic family that also includes zero turn, large capacity machines and spreader only machines. Check them all out at groundlogicinc.com.